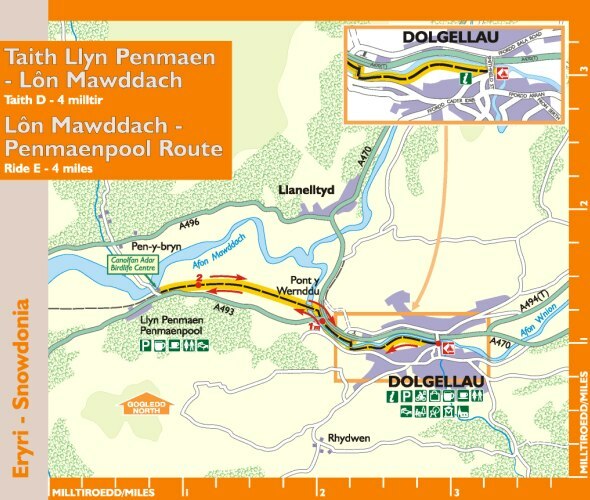 In addition to the many off road cycle routes we have in the area we have two way marked routes in Llŷn and Dolgellau. The Llŷn routes have recently being upgraded with a new leaflet printed which is available locally and a PDF is below for you to download. Llŷn and Eifionydd, is a gentle rural landscape of vales and hills, with rocky coves and sandy beaches. It is a land steeped in history with a living and thriving community. The routes described here follow narrow lanes winding between banks and hedgerows studded with wild flowers that include primroses, foxgloves, red campions, bluebells, honeysuckles and meadowsweet. Hawthorne, blackthorn, gorse and broom provide shelter. Oak, elm and sycamore are the larger trees whilst in Eifionydd rowan is common. What better way to take in the scenery and to explore this fascinating area than by bicycle? This journey begins along a section of the Pilgrims' Way to Bardsey Island in the picturesque village of Aberdaron. Here, in the church of St. Hywyn can be found two 6th Century headstones. Y Gegin Fawr, now a popular cafe, was once a stopping off point for pilgrims before the perilous crossing of Bardsey Sound. History abounds here and our trail passes an ancient burial chamber, a standing stone and a Stone Age weapons factory. The tranquil church in Llangwnnadl, another saintly destination, is also worth visiting. Ascending towards Mynytho, the view ahead is dominated by rocky Garn Fadryn. To the left is Porth Neigwl (Hell's Mouth) with Ynys Enlli (Bardsey Island) beyond. From the picnic site under Foel Gron, Mynytho, there is a magnificent view across Bae Ceredigion (Cardigan Bay) to the mountains of Meirionnydd. St Tudwall's islands lie beyond the bustle of Abersoch's bay. The little town of Nefyn received its charter from the Black Prince in 1355, and has a long history of seafaring. Nefyn was once famous for its herring fishing industry. The town's coat of arms depicts three of these fish. A maritime museum is housed in the old Church. While ascending the hill to Mynydd Nefyn a splendid retrospective view of Nefyn and Porthdinllaen unfolds. These two bays were once busy ports and echoed to the sounds of ship-building. The three peaks seen to the left are known as Yr Eifl (in English the Rivals). A remarkable feature of this region, known as Eifionydd, is Y Lôn Goed (lôn = lane, coed = trees). This stretches north from Afonwen near Chwilog to Brynengan on the slopes of Mynydd Cennin. Planted in the early 19th Century to serve the Talhenbont Estate, this avenue of beech and oak provides a fascinating seven mile walk. 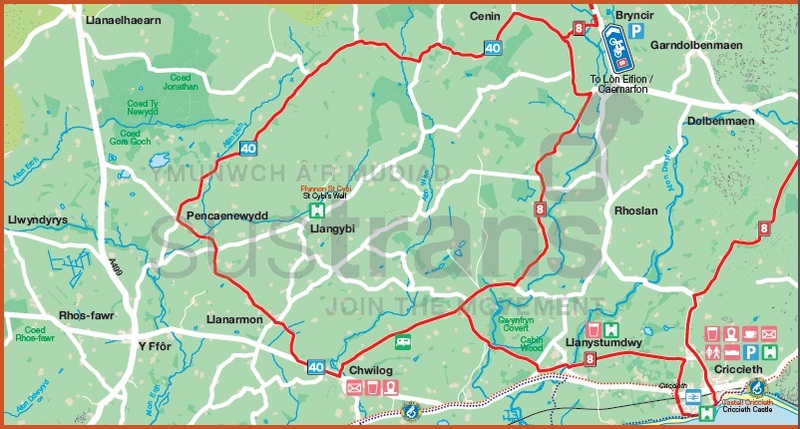 Your route crosses Y Lôn Goed near the farm of Betws Fawr and joins Lôn Las Cymru (National Cycle Nerwork Route 8) for a short section until this divides and eventually joins Lôn Eifion, part of Gwynedd Council's countryside access network known as Lonydd Glas. Spectacular views abound in the Snowdonia National Park throughout the year. Close to Dolgellau in Meirionydd the peak of Cadair Idris, Aran Benllyn and Aran Fawddwy stand guard above the valleys whose rivers meet at Dolgellau. When the rivers Eden, Wnion, Clywedog and Mawddach are in spate it is an awe inspiring sight. Such an aspect is often heightened by the autumnal colours of the trees. In the spring the plaintive bleat of a newborn lamb or the song of a solitary blackbird can be welcome heralds of a new year. The town of Dolgellau, with its distinctive architecture originally developed around a thriving woollen industry. 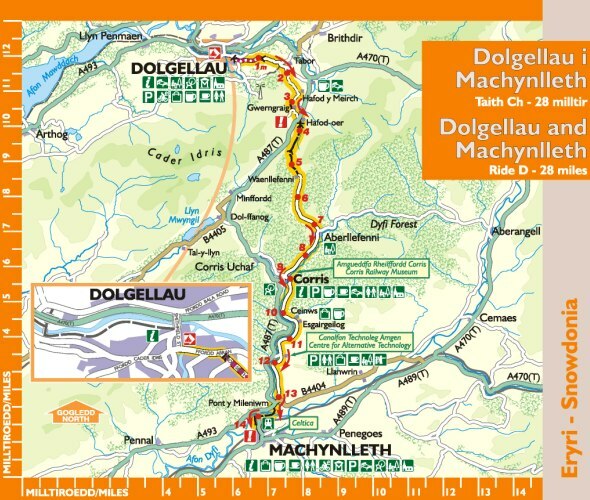 This route climbs out of Dolgellau in the direction of Cader Idris (983m). This magnificent mountain which towers over the region dominates the ride. The varied landscape of the wooded hillsides and open countryside with occasional glimpses of mountain ridges and cliffs provides a rewarding excursion. Lôn Mawddach ranks as one of the finest recreational paths in Wales. 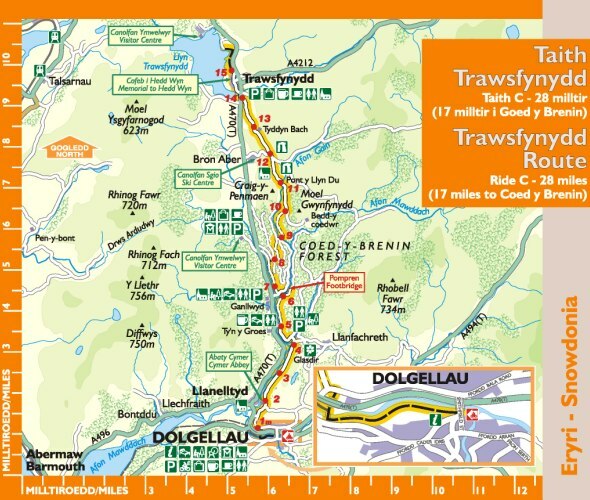 Relatively level, it passes through the Snowdonia National Park linking Dolgellau with Barmouth. The route uses the former track-bed of the Cambrian Railway. Fine views are afforded of the reiver estuary and surrounding hills at each turn of the valley. This is an area of outstanding natural beauty. This northerly forest route follows the courses of four local rivers. The Wnion, Mawddach, Eden and Gain offer their own special qualities as they flow down from the Meirionnydd hills. Initially, the route enjoys a high aspect on a quiet and picturesque county road. Just after the village of Ganllwyd the route enters the forest of Coed y Brenin (the forest of the King). The forest roads often have steep gradients with rougher surfaces, and this may be more suited to a rider with a degree of fitness and experience. This southerly route follows Lôn Las Cymru or National Cycle Route 8. 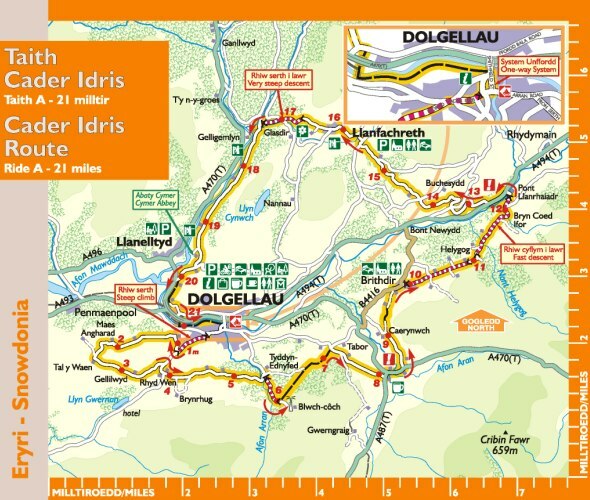 Whilst the initial 3 miles have an ascent of 350 meters out from Dolgellau, if you beat this initial challenge, the reward will be a ride along quality tracks with a backdrop of wild and lonely cwms (valleys). Before Aberllefenni the landscape changes as you descend through tree-clad slopes to the former slate quarrying area of Corris. This is shorter route along the beautiful Lôn Mawddach which still offers fine views and stunning countryside. The ride follows the bank of Afon Wnion, and starts in the car-park of Y Marian in Dolgellau. Before cycling an opportunity is presented to admire the striking granite architecture of the old wool town. No other town in Gwynedd can boast as many listed structures. Starting to cycle you may note on your left the commemorative stone circle of the 1949 National Eisteddfod. Next to the track on your right is a timber celebratory post for Euro Walk 2000. Its message of "May all beings be at peace" is the perfect sentiment for a ride into the peace and charm of the local countryside.